Through experience supplying millions of square feet of green roofing, a decade of research and an obsessive drive for continual improvement, we have developed evolving best practices for designing green roofs. We are pleased to share these experience with architects and engineers, so that there is no need to reinvent the wheel when it comes to green roof design. Call on us for additional support from your local LiveRoof professional, who is committed to ensuring successful projects that stand the test of time. We strongly recommend that you download and reference our Designer’s Checklist each time you design a green roof. This one page list includes design-related issues which may not be obvious but can have a large impact on the success of your project. Additionally, our revolutionary Spec Writer provides customized specifications based on the unique needs of your project, and takes little over a minute to generate. In the spirit of proactive design, we have included highlighted prompts in the generated document which alert specifiers to clarify requirements to ensure uniform bidding and clear expectations for critical issues such as irrigation and preventative plant care. Much of the information detailed below is also covered in our free online Continuing Education course: Green Roof Design Considerations. Visit AECDaily.com to take the course and earn continuing education credits with over a dozen organizations, including AIA and GCBI. Tall Buildings: How High is Too High? How Much Slope is Too Much? How Much Slope Is Too Little? 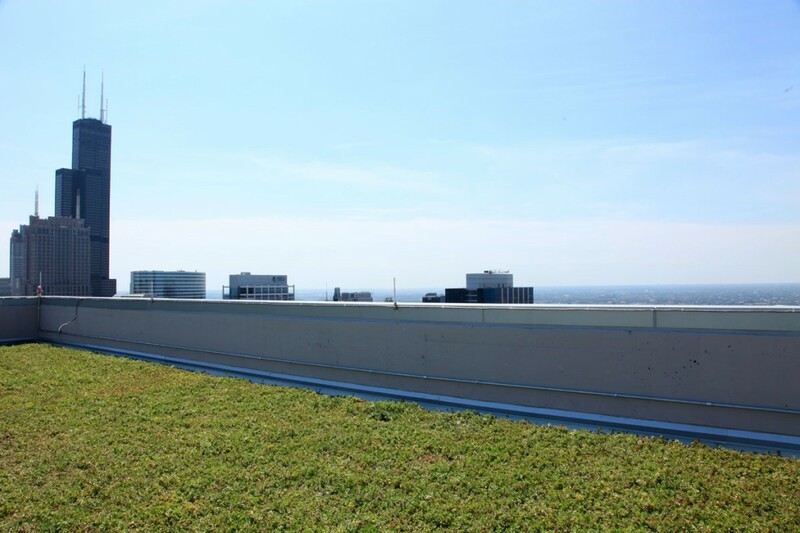 The LiveRoof Standard and LiveRoof Lite systems are “Extensive” green roof systems. In other words, their soil depth is less than 6 inches. And, while extensive green roof systems optimize evaporative cooling and storm water management (in part because they can dry down between rain events), their shallow substrate depth means that the plants they can support must be extraordinary at resisting drought. Practically speaking, the plants that work best in “extensive” green roofs must be exceptional “water conservers” as opposed to “water sourcers”. Water conservers are plants that store copious amounts of water in their fleshy stems and leaves. Cacti are the poster children for “water conservers”. They absorb water when available, and conserve it by closing their leaf pores during the day, by having a waxy cuticle over their leaves and stems, and by having relatively little surface area. Water sourcers, on the other hand, are plants that have extensive and deep root systems that go deep into the earth in search of water. Good examples of “water sourcers” are prairie plants such as little bluestem, purple coneflower, and prairie dock. Do you still have questions about plant selection for your green roof system? Your local LiveRoof representative can work with you to find green roof plants that will ensure that your project is a success. and “accent plants” that are exceptional “water conservers”. These are succulent, water-holding plants like Sedums, Alliums, Sempervivums, Euphorbias, Delospermas, and other species. The best LiveRoof plants both store water and have a special type of metabolism called Crassulacean Acid Metabolism, CAM for short. CAM plants are unique in that under drought conditions their stomates (leaf pores) are open at night rather than during the day (as is the case with most plants). CAM plants exchange gasses (oxygen and carbon dioxide) in the dark when it is cooler and less windy and therefore conserve water. And, CAM plants are up to ten times more efficient with water conservation than non-CAM plants. While it is popular to say that native plants are better adapted because they evolved here, this notion is not necessarily true. A plant’s toughness or suitability, is dependent upon genetics and ecological and environmental adaptation (evolving with time and exposure). There is nothing magical about latitude and longitude as there may be similar or more demanding environmental conditions on the other side of the globe. In reality some native plants are tough, some aren’t, and a few will grow in an “extensive” green roof without frequent irrigation. The list, however, is quite short as the native ecosystem parallel would be a giant rock covered in 2 to 4 inches of gravelly soil with loads of reflected light from bordering rocks. Such “real world” parallels are few and far between. Even though there is not a long list of native plants for use in extensive green roofs (unless one plans to frequently irrigate), there are a few to choose from. Such species as Sedum ternatum (white flowered sedum, a shade lover), Opuntia humifusa (prickly pear cactus), and Allium cernuum (nodding onion) are such plants. Of course, with regular and frequent irrigation, many others can be sustained, and plants that fall into this category include purple coneflower (Echinacea pallida) and little bluestem (Schizachyrium scoparium). These plants are very drought resistant in conventional landscape settings, because they are great “water sourcers”. On a rooftop with 4 inches of soil, however, they won’t survive for long unless regularly irrigated. Such plants are better suited to the LiveRoof Deep and Maxx systems. The Bottom Line: LiveRoof growers are interested in using plants that will be successful, regardless of regional nativeness. Rest assured, LiveRoof growers only use plants native to this planet. All plants are unique, and are opportunistic in one way or another. LiveRoof plants are no exception, and practically speaking, some species tolerate heat better than others, some cold better than others, some dry conditions, and others moist conditions. By combining species of varying growth characteristics, we strive to design each LiveRoof plant assortment to perform optimally in all seasons. Over time, depending upon the particular plant assortment, geographic site, climate and microclimate, the plant assortment will adapt and evolve. One species will increase its presence while another decreases its presence, from season to season, and from year to year. It is this evolutionary dance that helps to make each LiveRoof fresh and exciting now and in the future. While irrigation may only be needed during protracted hot dry weather (to sustain the plants), there are other reasons to install an efficient means of irrigating one’s green roof. Irrigation allows the green roof to be fully optimized. With the ability to irrigate during hot dry weather the rooftop can be turned into one big cooling unit and save money on air conditioning. Remember water liberates 8000 BTU of energy during evaporation (latent heat of evaporation), and pumping water is efficient and cheap, but running air conditioners is inefficient and expensive. The cooling effect derived by irrigating allows for the conservation of energy in comparison to the energy wasted on cooling by less efficient methods. According to some authorities, and dependent upon the particular climate, during the cooling season the temperature in the room below an irrigated green roof may be reduced 16 to 27ºF compared to a reduction of about 11-13ºF for a non irrigated green roof. This difference is substantial and can mean considerable savings on air conditioning costs. Estimates of cost savings for air conditioning range from 25% to 50% for the floor under the green roof. Irrigating during hot dry weather allows for the optimization of the green roof’s cooling ability. In rough figures, when an extensive irrigated green roof shows an average summertime temperature of 80 degrees, the same roof without irrigation will average about 100 degrees. Similarly, the membrane below the irrigated roof might fluctuate an average of only 7 or 8ºF during a 24 hour period, while the same green roof without irrigation may fluctuate ± 20 degrees. Less fluctuation may mean less wear and tear via micro-tearing on membranes, and therefore potential extension of the lifetime of the waterproofing membranes. full and beautiful. This means better coverage, fewer weeds, less labor, and happier owners, occupants, and visitors. It also means lower maintenance costs and safeguards one’s investment in the green roof. impact stormwater management as irrigation typically occurs only during low rain/low runoff periods when the roof will dry out quickly from evapotranspiration. Do you still have questions regarding irrigation? Your local LiveRoof representative can help you design an irrigation system that will keep your green roof looking great. He found that the cost of electricity for a ton of air conditioning in New York costs $13.50, while the evaporation of 33 gallons of water produces an equivalent ton of air conditioning for only 26 cents. Central to his comparison is the fact that virtually all electricity has substantial water cost for its production. Each ton of air conditioning requires 84 kilowatt-hours to produce. In four major cities, this quantity of electricity takes between 24 and 89 gallons of water to generate. On the average, each gallon of water used to cool a structure will save 1.7 gallons of water used to produce the equivalent cooling using air-conditioning. Overhead, matched-precipitation rotor systems are the best for irrigating green roofs, and they do a better job with less water than drip or sub irrigation methods. In 2011, an irrigation study was conducted in the MSU Plant Science Greenhouses by Bradley Rowe PhD, in LiveRoof green roof modules. Substrates that were watered with overhead irrigation retained more of the water dispersed with less waste than sub-irrigation and drip systems. This is because green roof substrates are designed with coarse-textures for drainage, and therefore do not wick water or move it horizontally very well. LiveRoof has developed a simple way to elevate irrigation lines and allow water to drain underneath. The new PipeRunner™ is simply set between two rows of modules before the pipe is laid and then covered with a protective layer of engineered soil, for optimum performance and aesthetic. As with any roof, high winds can pose a threat to the security of green roofs, and care must be taken to properly design and engineer the green roof so that it retains its integrity during high winds. To do this, consideration of wind pressure and associated variables, such as the building’s geographic location, surrounding terrain, shape, slope, height, building openings, parapet design, and other features is essential. At the tip of the iceberg, of wind pressure, one must consider the typical high wind speeds for that region. Consulting ASCE 7.95 Figure 6-1 Basic Wind Speed, or Factory Mutual Global Property Loss Prevention Data Sheet 1-28 is a good first step. In addition, the engineer must consider the surrounding terrain; for example, is the building situated along water, mountains, open field, surrounded by tall trees or taller buildings? Of course the building design itself is very important. The National Fire Protection Association defines “high-rise building” as a building greater than 75 feet (25 m) in height where the building height is measured from the lowest level of fire department vehicle access to the floor of the highest occupiable story. Low rise buildings (75 feet and lower) are less affected than high rise buildings (greater than 75 feet) which in addition to direct (positive) wind pressure are more greatly affected by negative wind pressure, often referred to as uplift or suction. Do you still have questions regarding wind pressure? Your local LiveRoof representative can help answer those questions for you. 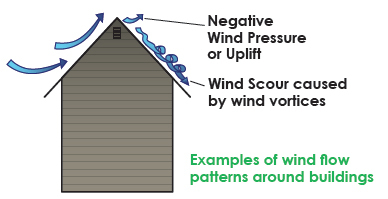 Positive Wind Pressure is the force exerted by the wind as it strikes an object, or building. Positive Wind Pressure is evident when a tree (or other object) moves or bends over in a strong wind. LiveRoof modules, when populated with a base mixture of flexible-stemmed hardy sedums (the backbone of the LiveRoof product line) were wind tested on 1/25/08 with wind speeds exceeding 110 MPH. In this test, the LiveRoof planting (4’ x 5’) was surrounded with RoofEdge edging and first exposed to 10 minutes of wind at 95 MPH, followed by 1 hour and 50 minutes at 110+ MPH. The wind was impinged directly upon the surface of the LiveRoof planting as would be the case when testing other roof coverings. Remarkably, at the end of the test period, there was no loss of growing medium and all plants remained well rooted and intact. Throughout the test, the plants simply arched over, held in place by their root systems. This test demonstrated the value of full vegetative cover as a means of stabilizing the green roof system. Negative Wind Pressure is what causes airplanes to fly, and it’s what causes roofs to want to fly. Negative wind pressure occurs when wind passes over an object that causes the wind to redirect and accelerate. This in turn creates a pressure differential and the pressure differential can be substantial. In the case of roofs, wind accelerates as it passes over the roof edge or parapet, causing a pressure differential and lifting force, uplift, that is exerted upon the rooftop. Redirected winds of this nature tend to whirl and swirl, often in cone shaped vortices which can aggressively scour roof surfaces and components. Such forces are typically greatest in the corners of the roof, secondarily along the parapet walls, and to a lesser degree in the “field” or center part of the roof. Uplift forces vary with the building shape and height, parapet shape and height, overall exposure, size of openings, etc. 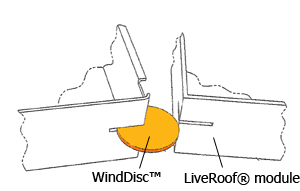 The WindDisc is a simple way to secure LiveRoof modules together to improve wind uplift resistance. The WindDisc technology allows for any size LiveRoof modules or RoofStone pavers to connect together across a green roof installation. Please contact us for more information. The Canadian Standards Association (CSA) launched CAN/CSA A123.24-15 in 2015 as a testing standard to determine response of a vegetated roof assembly (VRA) to Wind Pressure and Wind Flow. The standard defines a VRA as the modular vegetated system (pre-grown vegetation in the form of modules, blankets or mats, growth media, root barrier, pavers and drainage system) and the roofing system (deck, membrane, vapor barriers, insulation coverboard, etc.). Membranes must be fully adhered. This standard may only be used to test modular or thin-layer mat systems where all the soil is contained in the mat and which are installed with at least 80% vegetation coverage. This means that built-in-place systems planted with plugs, tiles or mats may not be tested under the current standard. To test for Wind Pressure, a full scale uplift chamber evaluates the ability of a vegetated roof assembly to resist a series of simulated “wind gusts” where pressure builds and subsequently drops. This test method is used to determine the amount of fatigue and uplift response of the green roof. The National Research Canada (NRC) conducted wind pressure tests on two LiveRoof assemblies in December 2015. Both assemblies sustained wind uplift pressures of 200 psf. The rating is issued after a 1.5 experimental factor, so the systems tested have an uplift resistance rating of 133 psf (6.36 kPa) under this standard. To test for Wind Flow, a high powered wind turbine evaluates the ability of a modular vegetated system to resist sustained high speed winds. This test method is used to determine the level of sliding, overturning or scouring of the green roof. During an October 2015 testing of LiveRoof system, the assembly sustained winds until the turbine maxed out during the 210 km/h cycle. The rating is issued based upon a 1.5 experimental factor, thus the system tested has a flow resistance rating of 83 mph (133 km/h) under this standard. In 2010 the American National Standards Institute (ANSI) accepted RP14 Wind Design Standard for Vegetative Roofing Systems as an American National Standard. This document provides design and installation recommendations to mitigate the risk of wind uplift on green roofs in high wind areas. LiveRoof modules are fully vegetated at the time of installation and have subterranean overlapping lips, which allows them to be sheltered from direct wind exposure. The LiveRoof Lite System is 2.5” deep and has a dry weight of approximately 10 lbs per sq ft, and thus meets the definition of #4 Ballast (3.13.1). The deeper Standard (4.25”), Deep (6.25”), Maxx 8” and systems meet the definition of both#4 Ballast and #2 Ballast (3.13.2). Do you still have questions regarding wind design? Your local LiveRoof representative can help. Low rise buildings in areas of moderate exposure may present fewer challenges in regard to Positive or Negative wind forces. But, taller buildings may cause one to have to be more creative. Design strategies that moderate wind uplift forces and disrupt the formation of surface-scouring wind vortices may be employed in the overall green roof design. Regarding low rise buildings, a lower parapet design may avoid potential air turbulence and help to minimize uplift forces. And, for buildings containing only a single parapet, as is commonly used as a facade for aesthetic purpose, one should keep in mind that the parapet may dramatically increase the uplift pressures in the corner regions. Conversely, on high rise buildings (over 60 feet), higher parapet height can be an effective tool in moderating uplift forces. Studies on parapet height typically indicate that parapets over 3 feet tall can moderate uplift pressure in the corners of the roof on high rise buildings. Likewise, the use of a partial parapet with attached porous screen may be used to reduce uplift pressures and expand design options for taller buildings. And, parapets of different shapes, e.g. saw-tooth configuration, rounded vs. sharp edges, or the application of spoilers are sometimes used. Keep in mind, that the taller the parapet, the more Positive Wind Pressure against the parapet itself, both windward and leeward sides. In very challenging applications an engineer may have to direct the architect to forego using the LiveRoof Lite system (about 9 to 10 lbs per sf when bone dry) in favor of the LiveRoof standard system (about 18 to 20 lbs per sf when bone dry). And, in the most wind challenged applications, an added means of securing the LiveRoof (either LiveRoof Lite or Standard) may be needed to safeguard the LiveRoof system. Accessory products for extreme uplift designs may include any or all of the following. Using the lab-tested WindDisc™ solution in all or the most uplift-prone zones of the green roof. Limiting the LiveRoof to the center “field” of the roof top, and using heavier ballast in the corners and along the parapet edges. Such ballasted perimeter design is referred to as a “vegetation free” zone. Vegetation free zones will vary with the parapet height and geometry. Tall buildings present three substantial challenges for green roofs. The first is wind uplift. This is a physical phenomenon that presents certain design and engineering considerations, discussed in detail under the wind uplift section. The second is wind scour. This is the physical displacement of soil and/or plants due to the force of the wind. The best defense against wind scour is full vegetation, which LiveRoof provides. It is also important to remediate any “bare patches” that might arise in the future. Bare patches can be caused by weed encroachment, nesting, birds, or physical damage. The third challenge involves the plants and their ability to resist the wind and cold at high building elevations. The answer to the question “how high up can green roof plant survive?” is not well understood, at least not at this time. Very tall buildings, for example over 20 stories tall, are subject to virtually constant wind. This in itself is not a problem as it can easily be offset with irrigation, and we would consider a built-in irrigation system mandatory on any tall building regardless of climate. At the present time, the level of experience and bona fide research with green roofs on tall buildings is limited. No one can say “on the 35th floor in New York City, you can effectively grow these five species of plants.” Therefore, at present we must rely upon anecdotal experiences, common sense, and horticultural know-how. The tallest LiveRoof brand green roof, to date is on a building that is 630 feet (58 stories) tall in Chicago, Illinois. Installed in 2014, it used the WindDisc system to connect the modules together across the installation. The plants were selected for their performance on other tall roof applications, and this “High Rise Mix” has performed well in this extreme environment. The tallest application of LiveRoof modules is atop 111 W. Wacker in Chicago, Illinois. Installed in 2014, the modules are connected with WindDisc modules. Going forward, we suggest that green roofs be applied to tall buildings with a cautious and thoughtful approach. Use the toughest, most cold-tolerant species, install them early in the season to allow for acclimatization to winter, and always incorporate a built-in irrigation system into the design. Work with the local LiveRoof representative to determine whether WindDisc™ or other uplift mitigation measures are required and to ensure that proper plants are selected for your high-rise application. National Research Canada has published a Wind-Roof Calculator on Internet for vegetated roofs to calculate roof cladding wind loads and vegetated roof assembly design parameters based on the National Building Code of Canada 2015. In January 2008, LiveRoof was tested to see how it performs when its surface is exposed to flame via a test method typically applied to other roof coverings. In this case, a Sedum-populated LiveRoof Standard modular system was installed on top of a plywood deck and subjected to a direct flame for 10 minutes. Following 10 minutes, there was no ignition of the plywood deck and no spread of the flame via the plant material. While, the plants in the path of the flame were scorched and reduced to ash, they did not ignite and spread the flame. Neither did the LiveRoof soil, and the module itself remained intact. Note: if the LiveRoof modules were populated with plants other than Sedums, which are succulent, the result may vary. For example, if dry grasses were planted in the system, one might expect them to burn and propagate the flame. In 2010, the American National Standards Institute (ANSI) accepted GRHC/SPRI VF-1, Fire Design Standard for Vegetative Roofs as an American National Standard. This document provides design and installation recommendations to help eliminate the risk of fire on green roofs. A code change proposal has been submitted to the International Building Code to include this standard in the 2012 edition of the International Building Code. Depending on the plant selections, LiveRoof systems meet the requirements to qualify as generic fire-resistant “Succulent based systems” (4.1.1) or “Grass based systems” (4.1.2). Do you still have questions regarding fire? Your local LiveRoof representative can help answer those questions for you. In July 2011, the LiveRoof Hybrid Green Roof System became the first to be FM Approved according the FM Standard 4477. Developed by FM Approvals, LLC, FM Standard 4477 is the approval standard for vegetative roof systems. It evaluates green roof performance related to fire, foot traffic resistance and water leakage. In addition to testing the LiveRoof system, FM Approvals examined LiveRoof’s manufacturing facilities and audited its quality control procedures to verify that the company produces a consistently uniform and reliable product. 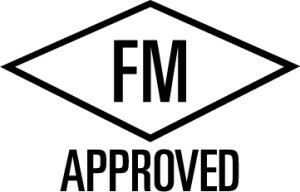 Recognized and respected worldwide, the FM Approvals certification process assures that products and services have been objectively tested and proven to conform to the highest property loss prevention engineering standards. Building owners and facility managers who rely on FM Approved products now have LiveRoof as a certified green roof solution. The approval is granted to the LiveRoof Standard and Deep Systems populated with succulent groundcovers. For specific information on Approval requirements and compatible membrane assemblies, view our FM Approval Report. Do you still have questions regarding FM Approval? Your local LiveRoof representative can help answer those questions for you. Retrofit Projects are exciting as they represent a tremendous upgrade to aesthetics and environmental quality. Of course, they bring their own particular challenges that need to be addressed from an architectural and engineering standpoint. Here are some of the main considerations for retrofit green roofs. Determination of the construction, condition, and load capacity of the pre-existing roof and suitability to accept a LiveRoof. Determination of the condition of, remaining warranty lifetime, and terms or warranty of the existing waterproofing system as it pertains to being retrofitted with the new LiveRoof. Compatibility of the existing waterproofing system with the proposed slip sheet membrane. All the same issues regarding positive and negative wind pressure, slope, and forces against the parapet as they relate to new construction also apply to retrofit roofs. Do you still have questions regarding retrofitting a green roof system? Your local LiveRoof representative can help answer those questions for you. LiveRoof is compatible with nearly any roofing system on the market. Over the years, we have seen our system successfully installed atop membranes manufactured by nearly every supplier in North America. In recent years, more of these manufacturers have decided to introduce their own green roof systems. The quality and the integrity of these systems is variable, thus certain manufacturers have used warranty provisions to limit options for their customers to only system which they sell or market. The most common warranty used to control the green roof options are overburden removal warranties. Other membrane manufacturers may consider adding overburden removal coverage on a case by case basis. When overburden removal coverage is not available from the membrane manufacturer, LiveRoof Overburden Removal Warranties may be purchased for terms of 10, 15 or 20 years. This warranty provides coverage for the costs to remove the green roof and to replace it after the leak has been serviced. Only Diamond Level LiveRoof Certified Installers are authorized to provide LiveRoof overburden removal coverage. Contact your local LiveRoof representative for referrals to qualified contractors in your region. * Sika Sarnafil full system warranties may only be installed by Elite LiveRoof Installers and maintained by Elite LiveRoof Maintenance Contractors. Do you still have questions regarding warranties? Your local LiveRoof representative can help answer those questions for you. The slip sheet is the protective layer used between the modules and the membrane. The material is typically selected and provided by the membrane manufacturer. For Conventional Membrane Roof Assemblies, we recommend a minimum 1-1.5 mm (40-60 mil) thickness with overlapped and effectively bonded seams to ward against root penetration and to keep waterproofing layer safe and clean from soil during installation. -EPDM, with seams overlapped a minimum of 75 mm and glued with roll out adhesive or double sided tape adhesive of the type that is impervious to and not affected by moisture, and recommended by the manufacturer. -Low profile drain board of appx. 0.5 mm (17 mil) thickness, with edges overlapped 75 mm and glued with manufacturer approved adhesive. For Protected Membrane Roof Assemblies, we recommend a minimum .25mm (10 mil) thick slip sheet of woven polyethylene or other non-moisture holding material to be installed above the membrane and below the insulation, as specified by membrane manufacturer. A minimum .25mm (10 mil) thick slip sheet of woven polypropylene or other non-moisture holding material to be installed above the insulation and below the green roof modules, as specified by membrane manufacturer. Do not use duct tape or adhesive for seaming that is not approved by the membrane manufacturer. Never use moisture holding fabric, such as needle-punched polyethylene or felt, under the green roof system. Such materials are trap aggregate and are impossible to sweep during installation and stay wet and encourage root growth and root penetration, which is especially detrimental if woody plants become established as such plants have woody root systems and may potentially cause roof leaks. This could lead to impeded drainage and compromise plant health. In cases where electronic leak detection may be desired, a fiber-backed drainboard may be used. Fiber-backed drainboards are only recommended when electronic leak detection is desired, and only when vegetated with Sedums or Sempervivums, or other succulents, as these plants are sparsely-rooted and not prone to rooting into the fiber of the drainboard. Do you still have questions regarding slip sheets? Your local LiveRoof representative can help answer those questions for you. The combination of a green roof (unaffixed object), slope, and gravity imply the need to address physical containment and resistance to downward pressures exerted by the green roof against the parapet and mechanical fixtures of the roof especially in cold climate areas where ice crystals may form on the slip sheet/root barrier surface during winter. For this reason, LiveRoof recommends that the slope and size of the roof be assessed in regard to force that will be exerted against the parapet or other mechanical features of the roof. For the convenience of engineers, LiveRoof provides force tables for use in designing each particular LiveRoof project. These tables assume “zero” friction and present a conservative model based upon the assumption of ice between the slip sheet membrane and the LiveRoof modules during the winter months. Obviously, this may not be appropriate for frost free zones, but one must realize that certain roofing membranes are coated in talc or other lubricants to prevent sticking. Others membranes may be slippery when wet. Therefore, even in frost free zones, one should assume a degree of downward force on sloping applications. For long roofs and roofs with great slope, it may be appropriate to incorporate “stops” or buttresses in the design to prevent all of the load from being exerted against the parapet on the low side of the roof. In all cases, it is important to realize that the low side parapet must be built in such manner as to have the structural integrity to resist whatever forces exist given the design of the particular roof. Do you still have questions regarding slope? Your local LiveRoof representative can help answer those questions for you. Both of the main international green roof organizations, the German FLL and North America’s Green Roofs for Healthy Cities agree that green roofs should not be applied to roofs with slope of greater than 40 degrees. This stems both from containment challenges but also from the extreme difficulty in managing soil moisture on a roof of such pitch. You may be familiar with the properties of a wet sponge, where it will hold so much water when laying on its side. But, after you prop it up on its end even more water runs out. Soil acts the same way and as the pitch of the roof increases, there is a greater tendency for the water to want to run out of the system. Green roofs above 2’/12’ pitch are commonly dry at the top and moist at the bottom. And, while the segmental or baffled characteristic of LiveRoof may help to mitigate this phenomenon, pitched roofs will certainly require more irrigation than low sloped green roofs. While this question is seldom asked, it is important to design for adequate drainage. Most authorities state that a roof needs ¼”/12’ slope to provide adequate drainage. Without this, water may accumulate and damage the health of your LiveRoof plants. Most LiveRoof installations simply follow the contour of the roof for a lovely, gently-rolling, meadowlike appearance. If a dead-level LiveRoof is required, it can be realized by applying a tapered closed cell foam to the roof above the waterproofing layer. If this is done, the closed cell foam must allow for adequate water drainage. Using LiveRoof and foam as a lighter alternate to soil-filled planters. LiveRoof can be used as a lightweight alternative to deep planters filled with soil. Many designers want to break up space and/or add seating with taller planters, while reducing the overall load on the roof. Layers of insulation can be cut to fit to fill the planters, and the green roof modules placed atop it. LiveRoof Standard Module Saturated Weight: Appx. 27-29 lbs/sf saturated and vegetated. Do you have questions about using LiveRoof in planters? Your local LiveRoof representative can help. From the perspective of civil engineers and city planners, the capture of rainfall may be the greatest perceived benefit to green roofs. Sewage infrastructure and retention tunnels are expensive, and green roofs can have a significant impact on reducing the need for such infrastructure. Use the image below to estimate your regions precipitation. For a more in depth review of precipitation for your region, click the image to visit the National Weather Service website. Soil acts as a sponge in capturing and holding onto water. But, soil is less porous than a sponge, and will take longer to absorb and hold onto water. For this reason, if a rain event is very fast and intense, such as 1 inch over 15 minutes, a certain amount of water may sheet across the soil surface to the roof drains, before becoming absorbed by the soil. On the other hand, if a 1 inch rain comes in a gentle soaking drizzle over the course of a couple of hours, the efficiency of water capture is much greater. Do you still have questions regarding water retention? Your local LiveRoof representative can help answer those questions for you. Confirm with you local LiveRoof Licensed Grower. While irrigation is used to sustain the LiveRoof system during hot dry periods, a particular roof will likely experience little reduction to its absorption of stormwater. Typically irrigation is used, temporarily, during times of sparse rainfall and the added water is mostly evaporated or sequestered by the plants. The map below contains data and information links for rainfall absorption rates from studies performed across North America. Remember, wind uplift should be managed during the entire installation process. High winds can come at any time and will not wait for the installation process to be completed. Be sure to cover materials with appropriate temporary ballast. Do you still have questions regarding job safety? Your local LiveRoof representative can help answer those questions for you. LiveRoof® BIM Components for the LiveRoof Standard, Lite, Deep and Maxx Systems are now available on Autodesk® Seek and our details page. Would you like to download LiveRoof BIM components? They are available on our website. LiveRoof Global is pleased to provide the online continuing education course, Green Roof Design Considerations. The course satisfies AIA, HSW, GCBI and many more continuing education requirements. Visit AECDaily.com for a full list of qualifying education credits. Are you ready to earn continuing education credits? Take our online course. On our website, we mention these considerations as an impetus to diligent design and engineering, but do not purport to have specific knowledge of engineering principles. Such expertise and accompanying liability is the domain of qualified engineers. We will continue to pioneer new research to continue to provide improved support services to engineering professionals. For now we offer these considerations to stimulate a diligent review of design and engineering considerations as they pertain to green roofs.